Our dorms are in European standards and designed to accommodate people. They are all clean, air-conditioned each bed has sheets and blankets, and an electric socket for charging electronic equipment.The Dorms have shared bathrooms, with hot water and hair dryers. 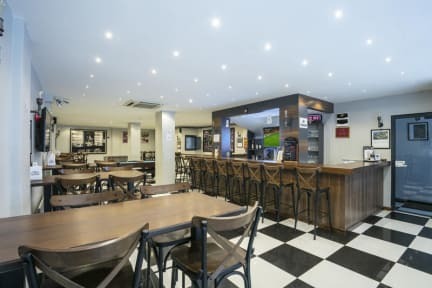 We also offer common leisure time facilities including free WIFI, a public kitchen, a balcony for smokers, a giant chess, pinball and darts, stage for artist and musicians, big screen tv for football games and projector for events. We have a Bar & Restaurant, run by an experienced staff, who organize events to help you have an unforgettable Istanbul experience. Our facility is situated in Kumkapı which is a unique historical area of fisherman restaurants, blended with Armenian and Ottoman architecture. Public transport: T1 tram and M1 & M2 & Marmaray are 10 min away. We are situated close to everywhere! You need to present us the ID or passport same as in the reservation made. 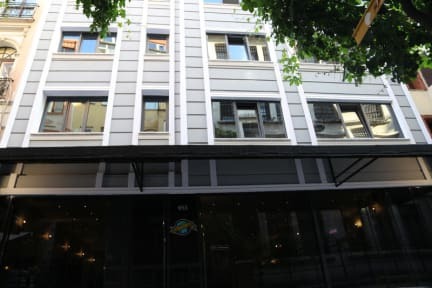 Nice hostel, clean, reasoanle price , helpful stuff and good location. l like it and definitely recommended. Really Great and enjoyable hostel. Close to historical places and subway. Clean and funny place, enjoyable stuff. Its a nice hostel with perfect location The staff was very friendly and helpful. The hostel was clean and safe .It's cloese to the Grand Bazaar and Sultanahmet .You can go to historical places easily . In addition there is a good access to metro station therefore you. Had a very good time staying in this hostel. Thank you , I 'll stay with u when I come back. Friendly and helpful staff. Location is walking distance from popular sites. Place is well cleaned and decor is nice and simple. Would come back the next time! A good hostel for its value and helpful staff. The toilet and bathroom were always clean. The only complaint I can make is that the sheets provided were clean but had a few scattered holes (but it's my fault I did not mention it to the staff, I'm pretty sure they would have changed them). Anyway, I will return to this place. Nice hostel, staffs very helpful and friendly. Our room of 6 was small but clean. Breakfast included, simple but good. With suitcase , reaching to the Hostel won't gonna be easy for you. Particularly in the weekend no taxi goes around that area, it's trafick blocked, cobblestones makes it even harder to walk. Atmosphere is friendly. Everybody especially Stephen receptionist) are trying to help. If you love Oriental music, it's party place around all the weekend, which you can hear music in Hostel! At last, Hanci is quite clean, breakfast is ok, it's near Egyptian Bazar, Kapali Carsi and Eminonu.